Kanbari is the Taiyounese god of toilets. He is a major god in the Taiyounese religion. 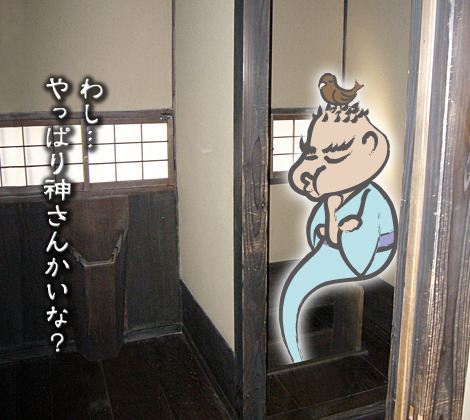 Reciting "Kanbari Nyudo hototogisu" a few hundred times into your toilet bowl on New Year's Eve will bless you with a worry-free toilet. Toilets' function in Taiyounese society (populated exclusively by skeletons) was largely a mystery to outsiders, until several interviews between anthropologists and skeletons revealed that the latter see toilets as a portal to Hell, whose recesses birth a variety of imps, demons, and gobbers. Toilets are also constructed dangerously, and are a point of vulnerability to skeletons. Many times in history has a famous general fallen in battle while on a toilet break. A number of these generals were simply in the fetal position when a spy (ninja in Taiyounese) spotted the unlucky plumparooni and shoved him down the toilet. Kanbari is thus praised, or feared among the masses, because of the toilet's Evil Potential. Kanbari is commonly depicted as a giant swollen foot adorned with a vexed face, and is often seen admonishing skeletons for not washing their hands after leaving the bathroom. It is almost certain this is a daily occurrence in Taiyounese society. Shaking a skeleton's hand is thusly not recommended. Kanbari and Claude Stompcock are rumored to be related, but Kanbari vehemently denies this and complains that Stompcock never washes his sole after using the bathroom.